A treadmill is an excellent tool for weight loss if you use it right because you don’t have to worry about the weather being an issue. Rain, excess cold or excess heat can interrupt a plan to run outside. As easy as it sounds, the treadmill can be tricky to get the hang of. The first time I used a treadmill, I felt awkward and couldn’t find a pace that suited me. It seemed that I was either running too fast or not fast enough. This article will tell you how to use a treadmill and not just use it but be able to drop consistent weight while using it. So, how do you use a treadmill the right way? How can you use it to lose as much as 20 pounds? Keep reading to find out. Thicker socks to fight blisters. Good running shoes: I can’t emphasize this enough. Your shoes should be supporting your arches and cushioned for comfort. Your toes shouldn’t feel cramped. This isn’t just for convenience but also injury prevention. Wrong shoes can be the reason for sprains, bruises, blisters and much more. Bottle of water to stay hydrated during your workout. Before you start any exercise, you should always warm up your body to avoid pulled muscles or aches and pains when you are done. This is usually a light walk that progressively gets faster for about 5 minutes. You will begin to feel when your body is getting warm, and your breath is starting to get more rhythmic. It may take longer for some than for others. When you feel good and warm, you can do some light dynamic stretching like arm swings, toe touches, and torso twists. All treadmill comes with an emergency cut-off key that connects to the treadmill and your person. 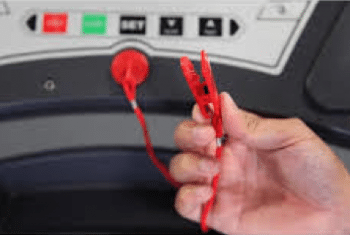 That way, hopefully, this never happens to you, but it does happen, if you should fall during the time you are using the treadmill, the key will come out of the treadmill, and it will automatically shut off. This is a great safety feature that should always be used. If you don’t know where the safety key is, check your manual or if you are at the gym, it should be hanging from the console. Some are magnetic other plastic keys that plug into a slot somewhere on the treadmill. Before you get started in a long workout, you will want to make sure you know all the great features that your treadmill has to offer. 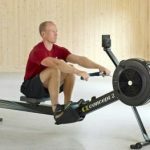 This will not only allow your workout to be more comfortable and possibly more entertaining, but it will also ensure that you know how to change the settings mid-workout if you need to. The treadmill has a control console on the front top. All models have different types and settings, so it’s important to check yours well and try some buttons out to see what the effects are. Most treadmills are equipped with a QuickStart button that makes the treadmill start at the lowest setting. You should always use this key when beginning. Find it on your treadmill. You also need to find the speed setting and incline to set. Both should have a button to increase and a separate button to decrease the environment. Many treadmills have programmed workouts built in that will adjust these automatically while you work out if you are starting, it’s best to stick with manually changing these settings. Technological features can make your workout go by faster and be more fun. 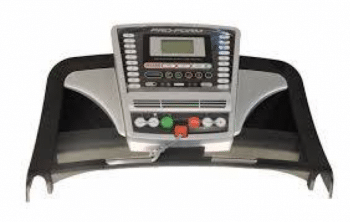 For example, some of the treadmills have ports for your mp3 player or smartphone with built-in speakers that allow you to play your most motivating workout playlist. Other features include the ability to connect through Bluetooth to sync your workout with fitness apps like MyFitnessPal and MapMyFitness. This allows you to track your calories burned and progression as you go. It’s important to know and feel comfortable grabbing your handles when you need to stabilize yourself, but you should also remember that during your workout, you shouldn’t be holding the handles the entire time. 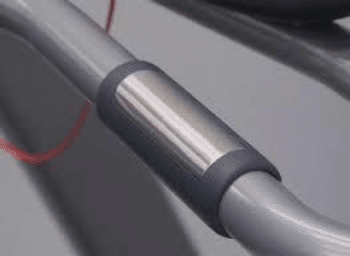 Some handles will have a built-in heart rate monitor which helps to make sure you are hitting your desired heart rate during your workout and tells you when to step it up or slow down a bit. The image below shows you what these look like. This will cause an imbalance in your strong positioning, and your back will begin to hurt. During your workout, you should start to swing your arms in tune to your strides. This will not only help you to keep your balance but also burn more calories during your workout. Your correct running posture will make your run easier not only on your effort but also on your body. Running with a bad attitude can cause injury. Keep your gaze looking straight ahead and not down. This keeps your neck and spine aligned. Also, make sure that your ears aren’t further up than your shoulders. Sometimes we can tend to lean forward with just our head. Your shoulders shouldn’t be hunched, but open and slightly back. Your arms should be at a 90-degree angle. Your hands should be relaxed, not in a fist. Your core should be tight and elongated and twisting slightly as you step forward. As you run, you want to lean slightly forward by hinging at the hips. As you step, your knee should line up with your toes. When your foot hits the ground, your entire leg should be in the most alignment as possible to share the shock absorption, and you should be running the field with the ball of your foot, not your heel. When you are on an incline, your hips should be even more forward, and your arms and legs should be pumping more. Alright, now that you’ve got all that down, it’s time to finally begin to run on your treadmill. When you step on the treadmill, make sure that your feet are near the front of the running area within arms reach of the handles. This is a safe running area. Turn on the treadmill and make sure your safety key is secure still. Push the Quick Start button and walk along with the movement of the running area. In about 10 seconds, adjust your speed setting to about 4 (15 min mile) and keep this speed for about 5 minutes. Pick up speed to 5 for four more minutes and then increase again to 6 for 2 minutes. Reduce speed back to 5 for 4 minutes then increase to 7 for 2 minutes. Reduce again to 5 for 4 more minutes then back up to 6 for 2 minutes. One more time back to 5 for four minutes then again at 7 for 2 minutes. Finish the run at 4 and keep that speed for 3 minutes. Then reduce to 3 for 2 minutes, and finally walk for 2 minutes. At this point you should feel nice and cooled down, your heart rate should be slowing, and you should be catching your breath. Doing intervals helps to keep your heart rate up high enough to burn fat but is more comfortable than trying to maintain a high speed during the entire workout. This helps you lose weight consistently and see pounds drop like butter, as much as 20 pounds in 2 months! Turn the treadmill off and remove your safety key from your clothing. Cool down your workout by stretching your muscles. The tightest muscles at this point will be your calves. Stretch them out by sitting on the floor with your feet out in front of you, legs straight. Grab your toes (or stretch as close to them as you can with your torso). Finish off by stretching the rest of your body, focusing on parts that feel tight. You can repeat this workout as many times as you want. When it gets more comfortable for you, it’s time to make you’re run more challenging. This helps you to continue to lose weight and see a difference in your physical fitness. 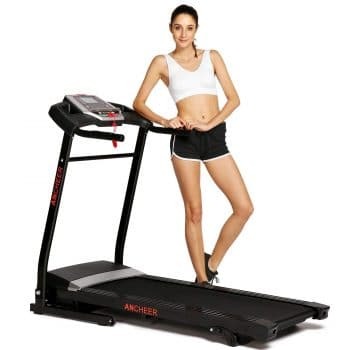 Did you enjoy this article on how to use a treadmill to lose weight? Do you have any questions or comments? Feel free to leave them. If you know of anyone else, who could benefit from learning how to use a treadmill, feel free to share this article with them.